For all the nonsense about it being a national symbol, the Liberty Bell is basically just a big bell with a crack in it. Yet people queue up to see it, when they're surrounded by a series of top drawer historical attractions. Within a few steps you've got Independence Hall – where the Declaration of Independence was signed – the National Constitution Center and the Museum of the American Revolution. All of which are thoroughly riveting, and play a big part in Philadelphia being perhaps the most underrated US city. There's plenty of good hiking and a generous sprinkling of beautiful lookouts in the Black Hills National Forest. 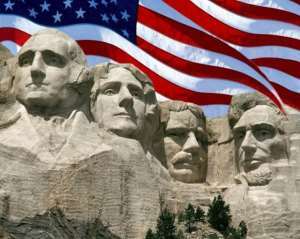 But the reason most people come to this relatively remote part of South Dakota is to see Presidents Washington, Jefferson, Lincoln and Roosevelt carved into the mountain. They may be around 20 metres high, but once there, they just look kinda small and insignificant. A regular inclusion on road trip itineraries heading through the American West, the Four Corners Monument is where Utah, Colorado, Arizona and New Mexico meet. Alas, it's little more than a big circle on the ground. Monument Valley, on the Utah – Arizona border a couple of hours' away, however, is likely to be where you'll be beforehand. The buttes and mesas there are properly amazing, so allocate a bit more time to that instead. It's not that Key Largo's bad, exactly – there is some excellent snorkelling and diving to be had on the reefs running parallel to it. It's just that it doesn't have the feel of what the Florida Keys are supposed to be about. It could pass for just another suburb of Miami. The woozy, colourful, island time vibe of the Keys kicks in about halfway down to Key West. Drive a bit further, and things feel much less uptight. New York's centrepiece is also, unquestionably, the worst part of New York. Giant advertising billboards, the M&Ms store and way too many people do not for a pleasant experience make. The only reason to spend any time there is to get discounted same-day Broadway tickets from the TKTS booth. And even that can be done better, with shorter queues, at the Lincoln Center. The globe-swallowing Starbucks coffee chain kicked off in Seattle in 1971, and 'the Original Starbucks' in heavily-visited Pike Place has kept its retro look. But there are dozens of better places to get coffee in Seattle, and this isn't even the original location – the café moved to Pike Place in 1976 after five years on nearby Western Avenue. In a city packed with stunning architecture, the best blues bars on earth and brilliant public art, wasting any time at all on Navy Pier feels like an outrageous dereliction of duty. It sticks out into Lake Michigan, there's a big wheel you can have a ride on, and there's some mostly bad food to eat. There's also an IMAX cinema and a few kid-friendy funfair- esque attractions, but it really doesn't deserve to be Chicago's most-visited tourist attraction. It's a surprisingly long, sweaty hike to get out to the Hollywood sign. And, once you're there, you're really too close to get a good photo of it. You can get a decent shot from the Hollywood Observatory, and walking in the hills and canyons is one of the best things about Los Angeles, but it's really not worth the detour to see some big letters on a hillside. The National Mall in Washington is incredible. There's the Capitol at one end, the Lincoln Memorial at the other, plus dozens of other memorials and Smithsonian Museums that you could happily spend weeks in. But standing tall in the middle is a giant obelisk that, since an earthquake in 2011, you can't go inside, so all you can do is mill around craning your neck. This should change in May, when the Monument is due to reopen, and you'll be able to go up in the elevator. Santa Monica, Malibu and Miami's South Beach may have high people-watching value, but the best beaches in the US don't hold a candle to the best beaches in Australia. The marketing pitch may work elsewhere, but Australians are likely to go: "Is that it?"